There‘s nothing worse than procuring a video from the internet, only to find out your lovely Android device won’t play it. Lucky there’s an app out there that will mean you will never have to wipe away the tears of frustration again, because mVideo Player plays pretty much everything you throw at it. This handy app is a delight when it comes to everything video. It plays MP4, M4V and 3GP files and can also add a subtitle track if you so need it. The app also takes data from IMDb, so that when you load up a film, it comes with a bunch of information you can read before putting your movie on. mVideo also does intelligent things such as remembering the moment you stopped watching a clip, and you can gesture seek backwards and forwards. 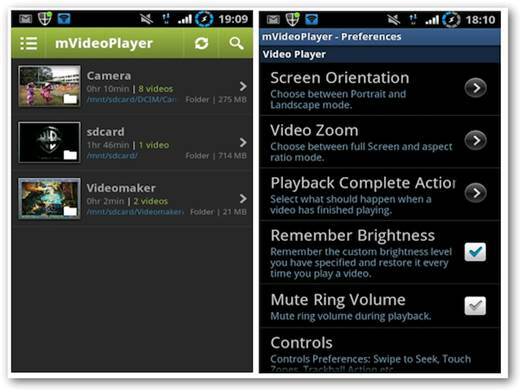 You’ve got to love it when apps work the way they should - mVideo will revolutionize the way you watch video on your handset. Making sure you know instantly who is trying to ring you, Full Screen Caller ID provides, well, just that - full-screen notifications for all your incoming and outgoing calls or text messages. If you’ve already synced your Facebook friends with your contacts, you’ll soon find out that profile images that have been grabbed from the social networking site appear significantly poor in quality, now they have been stretched to the entire screen. That means you need to grab higher quality images from your camera, SD card or Facebook to suit the larger surroundings. Once you’ve selected all your images, you can also set the theme for the call screen. If seeing the name flash across the screen is not enough to alert you about who is calling, this is by far the easiest and most straightforward way to add large images to your call screen. The price may seem steep, but while there is a free version, you need the full version to benefit from features such as Facebook syncing, themes and the all important ad-removal. To many, The Economist is the place to go to find out just what is going on in the world. 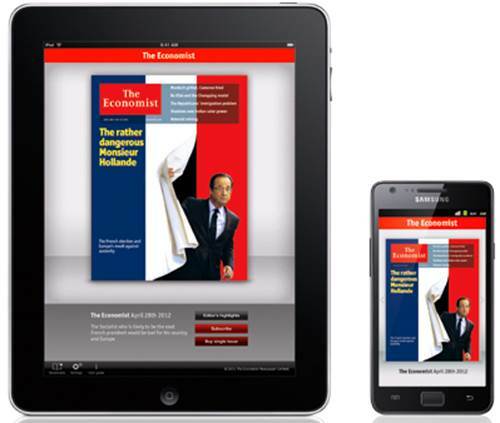 From politics to business, the publication has been guiding thoughts for more than 150 years, and it looks set to continue this impressive feat in the world of tablets and mobiles with the launch of the Economist app for Android. In short, The Economist is an app that truly makes your phone smart. It offers free insight from The Economist’s wealth of writers, giving you enough of a tease to make you seriously consider purchasing a subscription to the digital edition of The Economist In fact, the whole app is geared up for you to do this. The preview gives you a good few articles and a decent feel for the app. It takes a few moments to download content but once this is done, you can swipe through the articles to read them. There’s nothing fancy with the way the app is laid out. It feels a lot like a mobile formatted website, but the amount of content is impressive. Given that a quarterly subscription to The Economist is a snip under $30, you may think twice before signing up. This does give you ultimate access to the digital content, however. As decent as Android is, for some reason Google doesn’t give the phones note-taking functionality. Luckily there is a number of apps that fill this void, with Evernote being one of the best. The ethos of Evernote is simple: take notes in any form and the app archives them for you for later use. Whether it’s a photo or a file, text or an audio note, you can store them for later and give the memory part of your brain some much-needed time off. 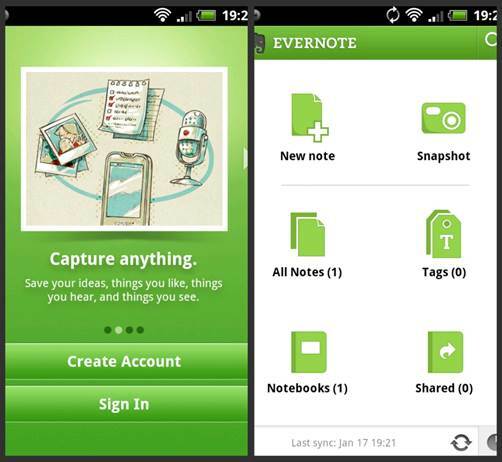 Evernote for Android enables you to search for your notes and sync with the desktop version. It is also easy to tag and organize the notes, alongside a whole host of other cool functions. Once archived, the notes appear as a thumbnail with text information - this makes it really easy to find that quick ‘note to self that you made a few weeks back. Although it is still in beta form, there is a lot of scope for Evernote. And the best thing about it is that it’s free. The worst thing about it is that you now have no excuse for forgetting that really expensive item your partner wants for their birthday. Google Goggles gives you the gen on anything you point your camera at. 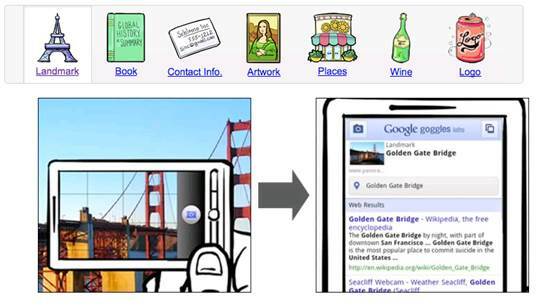 Those who have Android 1.6 or over can take full advantage of Google Goggles. While it is still in Labs (beta form), the app enables you to capture images with your phone and Google the results. Why would you want to do that? Well, if you see an awesome picture in an art gallery and want to find out more, you can take an image and use Goggles to search Google for details. And if you are in a foreign country and want to know what a certain landmark is, simply take a photo of it and run it through Goggles. The results are surprisingly slick - it doesn’t seem to recognize things like furniture but logos and the like work, as does taking images of CDs and books. It’s not a game-changer but it is one of the more fun apps on Google Play.